We leave on September 1st and return home on October 1st. 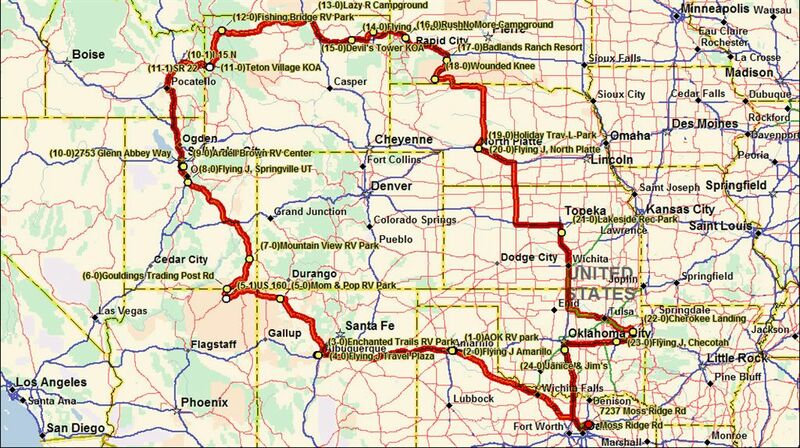 We start from Parker, TX and head west. We stop in Monument Valley just over the Utah border from Arizona, then slowly work our way up to the Salt Lake City area and spend 6 nights there both visiting with Natasha, Bret, Hayden & Dustin and doing sightseeing in the area. From there we head toward Teton NP then on to Yellowstone. After Yellowstone, we head to Devil's Tower, Mt. Rushmore & the Badlands. We make some stops in Oklahoma to visit friends & relatives before returning home. A most awesome trip. Awesome is the best descriptive of the entire trip. About 3700 miles. On the way.... just interesting rocks rising up along the road. Monument Valley, UT... rising from the valley floor....spectacular views. I especially like the sunrise pics. Canyonlands NP, UT…This is our 2nd time in this park, but to see the southern entrance that we missed last year. Not as spectacular as the northern entrance, but glad we came here too. Salt Lake City area...This time we make side trips down to Temple Square. Unfortunately the Tabernacle is closed for renovations, but we are able to visit an organ recital in temp facilities across the street. We also go back on Sunday morning and attend the rehearsal and broadcast Sunday radio/TV program where the choir sings. They are great. We also visit Timpanogos Cave. What a hike! Only 1 1/2 miles, but nearly 1100 feet rise in elevation. We took it slow, but oh it was worth it. Teton NP…No other place like it in this country. We see bears (mother & two cubs eating berries), moose, elk, deer and more. We could not take enough pictures of these unique peaks. We want to go back and hike more places. Yellowstone NP…No other place like it. We finally quit taking pictures of the bison. They were EVERYWHERE. Too bad we saw no bears here. Devil's Tower, WY…We went looking for our own close encounter. Glad we went. We had a great afternoon. In addition to the tower, we saw several other critters as you can see below. Mt. Rushmore, SD…Also Crazy Horse monument. The Badlands, SD... Like no other place in the country. A most interesting drive. We saw these guys on our way out. Fattest prarie dogs we've ever seen.